The fun, colorful, eye-catching banners make anyone heading to the local grocery store fully aware of where the Hilltop drycleaning store is; follow the arrow right around the corner. 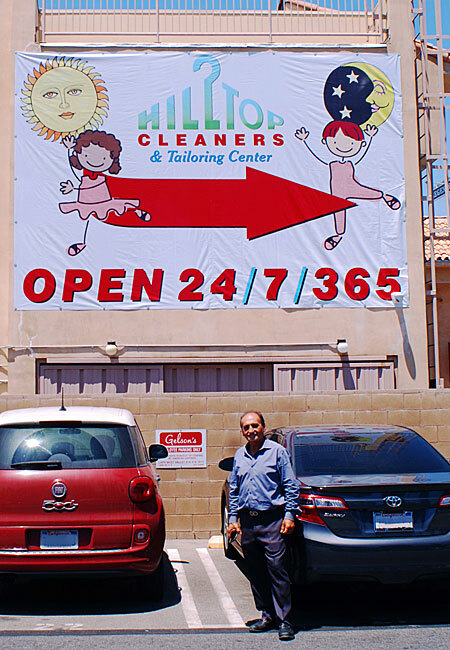 Hilltop Cleaners is right around the corner here from an upscale supermarket, Gelson’s, freelance writer Larry Siegel reports for Hilltop. For a long time, Siegel writes, Kohan had pondered how to get the market’s customers to drive half a block further to his cleaners, which happens to be open 24/7/365. The answer, Siegel explains, that came to Kohan was to get right into the market’s customers’ faces. He commissioned four huge banners to hang on the back of the cleaner’s building adjacent to the Gelson’s parking lot! “We use lots of posters and banners inside our plant to promote our services and some of them are up to five feet tall since we have high ceilings,” says Kohan. “But filling a 95-foot-long wall is on a whole different scale…literally,” he adds. Turning to Siegel, his marketing consultant/graphic designer, who has helped the cleaner with branding since 2010, it was determined that “playful” illustrations would convey Hilltop’s core messaging: name recognition; environmentally-friendly; tailoring; and being open 24/7/365. Siegel explains: “Ben said to add some ballet graphics, too, since the cleaners leases part of its building to a ballet studio,” and notes that what could have been a hurdle turned into a visual thread that tied the first banner to the last. Anchoring the first 20-foot-by-18-foot banner with an illustration of a “retro” woman hanging clothes on a clothesline that Hilltop had used in promotions eight years ago, the banners had elements that “linked” them together, Siegel points out. He indicates that the clothesline which started in the first banner ended in the second; running dogs and clouds appear in the second banner and continue into the third; and ballet figures in the first banner are the focal point in the last. A huge red directional arrow on the fourth banner leaves no doubt as to where Hilltop Cleaners is located and that it is open 24 hours a day, Siegel says. The banners, installed in late May, are definitely having an impact, according to Raquel Toledo, Hilltop’s office manager, who says: “Nearly every day, our customer service reps tell me comments from customers relating how the banners are ‘attention-getting’ and ‘cute.’ Definitely the desired result,” Toledo adds.